There’s a new paper out in PLOS One called A systematic identification and analysis of scientists on Twitter – yay! Being a big fan of science and Twitter, this sounds good. Unfortunately, I became aware of the paper because @Teachforaliving mentioned me in a thread on Twitter pointing out that chemists don’t feature all that prominently in the paper. Here we present the first large-scale and systematic study of scientists across many disciplines on Twitter. As our method does not rely on external bibliographic databases and is capable of identifying any user types that are captured in Twitter list, it can be adapted to identify other types of stakeholders, occupations, and entities. Our study serves as a basic building block to study scholarly communication on Twitter and the broader impact of altmetrics. The study makes a big deal of the fact that it finds scientists directly on Twitter by looking at the names of Twitter lists (rather than identifying scientists outside of Twitter and then using them as a starting point to build up a network of scientists that are on Twitter). The sampling method leads to the identification of 110,708 users included in 4,920 lists that contain recognized scientist titles in the list names. This sample is then refined by looking for scientist titles in the profile descriptions of the individual users and this gives a dataset of 45,867 scientists. 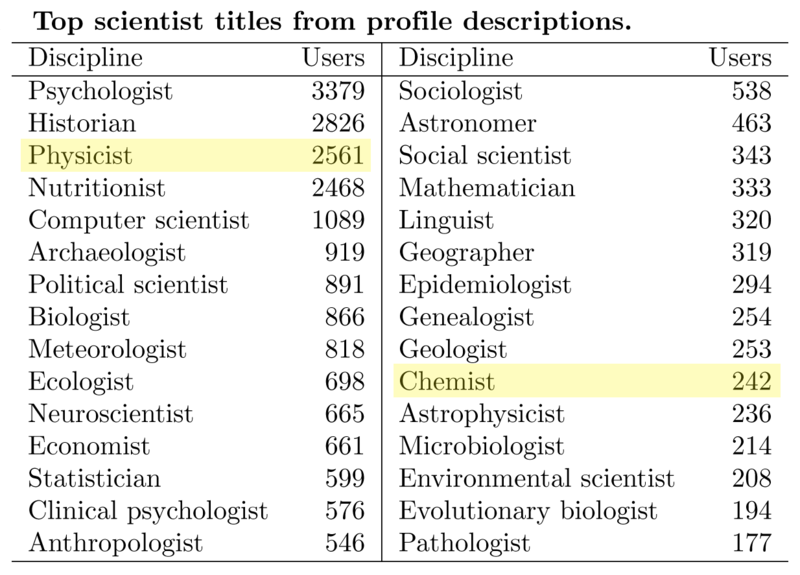 These are the top scientist titles from profile descriptions (Table S2 in the paper) – I’ve added the highlighting. 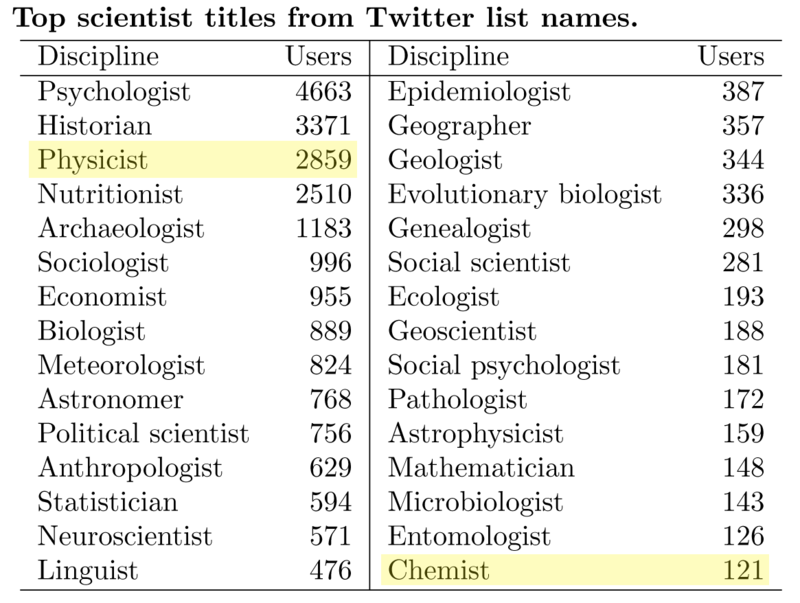 And these are the top scientist titles from the names of the Twitter lists (Table S3 in the paper) – again, I’ve added the highlighting. Those numbers for chemists don’t look all that big to me (and others have said so on Twitter too). And if the sample identified in this paper is representative of Twitter as a whole, it means that there are something like 10-20 times more physicists on Twitter than there are chemists. (I’ve chosen to compare physics and chemistry because they are both traditional core scientific subjects, but admittedly that’s about as rigorous as my analysis gets). (1) Maybe there are 10-20 times more physicists on Twitter than there are chemists. (2) Maybe physicists are more likely to self-identify than are chemists (we’re a shy and retiring bunch after all…). (3) Maybe the sampling method used in the study does not give a representative view of Twitter as a whole and picks up more physicists than it does chemists. How about UK scholarly societies? That’s closer. Now, how about their flagship journals? Hmm, interesting. Now let’s keep the publisher constant and look at Nature journals in physics and chemistry? Of course, it is not just chemists following the chemistry-related accounts and not just physicists following the physics-related accounts, but if there were an order of magnitude more physicists on Twitter than chemists, I think I would expect this to be reflected in the physics accounts listed above having, in general, larger numbers of followers than the corresponding chemistry accounts. Based on my totally unscientific survey of a small number of accounts, I would hazard a guess that the numbers of physicists and chemists on Twitter are not as different as the PLOS One study suggests. So, does the study overestimate physicists or underestimate chemists? Either way, my confidence in the study is not terribly high. I’ve curated two lists here on this blog (totalling 199 chemists – was 200, but hey) and I have another list on Twitter that includes more than 300 chemists, so that’s well over 500 chemists in total. Also bear in mind the quite active #RealTimeChem hashtag (and the @RealTimeChem account itself). And for an example of the scale at which chemists interact with Twitter, check out the recent #RSCPoster event, for which the numbers are quite impressive. The chemists are there on Twitter, perhaps some people just need to look a bit harder to find them. This entry was posted in Metrics-y stuff, Random and tagged chemistry, chemtweeps, plos one, twitter. Bookmark the permalink. RSC subject groups have their own accounts e.g. @RSC_CICAG (Royal Society of Chemistry Chemical Information and Computer Applications Group), @RSC_BMCS (Royal Society of Chemistry Biological and Medicinal Chemistry Sector), @RSC_HSG (Royal Society of Chemistry Heterocyclic & Synthesis Subject Group. Nice post. I’ve had similar thoughts about this study as an ecologist. The list-based method of identifying scientists is not ideal for the aims of the study – lists are purely subjective and depend entirely on the personal opinions, interpretations and connections of the person who created the list. Lists can also be made private and can be called any name that may not relate to discipline searches (e.g I have put many ecologists on one of my lists called Field Nats). To answer this particular study question, I think it would have been more realistic to search the Twitter ‘People’ tab for each discipline name.